Every season has one. It's either a turning point or a defining moment but it goes a long way toward determining how much success a club will ultimately find. It's something one can look back on and say, "That's when it all started going right (or wrong) for them." For Pittsburgh, that moment may have occurred on November 9, when James Neal returned to action against the St. Louis Blues. Because, while the Pens never found themselves in dire straits within the Metropolitan Division without him, it wasn't until Neal's insertion into the lineup that the squad broke free from an inexplicable scoring drought. And, while his name has been all over the score sheet in recent weeks, the sharpshooter's presence has meant so much more to the Penguins than the individual numbers "The Real Deal" continues to rack up. No one has benefitted more from Neal's return than Evgeni Malkin. For 16 games, Geno toiled without his trusted winger as he struggled to find chemistry with any of Neal's replacements. Sure, Malkin's 14 points in 16 games would prove impressive for most individuals. But this was a former Art Ross and Hart Trophy winner who failed to tally a single marker for 15 straight games. Consequently, as Evgeni battled through the drought, the whispers from the media and fans grew louder and louder as they collectively wondered what was wrong with one of hockey's brightest stars. In hindsight, it appears he just needed James Neal with him on the ice. Because, while the goal drought admittedly did not immediately come to an end after Neal's return, flashes of the brilliant chemistry the two share surfaced instantaneously. And, as Neal grew more comfortable and got his legs underneath him, that familiarity blossomed into a nearly unstoppable force. The reunion has certainly played a big part. Indeed, in the 13 games they've played together, Malkin has posted an astounding 23 points. The tear has catapulted Geno to the top of the scoring race, as his 37 points now trail only Sidney Crosby (38) in league scoring. Not bad for a guy who, only few weeks ago, suffered through the worst drought of his career. While the Pens' power play was operating at a respectable 20% prior to Neal's return, the unit did suffer through some dry spells, coming up short too frequently in critical situations. Upon his return, though, The Real Deal brought a new dynamic to the group, making it one of the most potent power plays on the circuit. After all, adding one of the game's best shots to a man advantage is enough to strike fear in the heart of any opponent. Not surprisingly, the unit has taken off since the return of "18", clicking at an astounding 33%. Of course, none of the above would likely be possible if Neal wasn't personally playing at a high level. 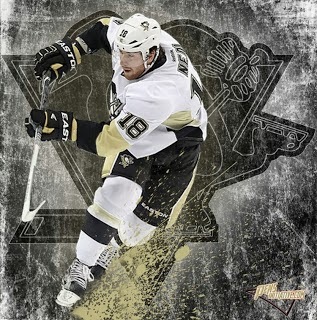 And playing well is something "Nealer" has made a habit of over the last few weeks. Indeed, only Malkin and Chicago's Patrick Kane have produced more than the 17 points James has tallied since his return on November 9. What's more, his nine markers top the NHL over the same time frame. "I think he’s still, with his passing ability, a little underrated with how good of a distributor of the puck he is. He puts the puck on your stick when you don’t think he can and does that on a continuous basis." The result? A duo that seems to grow more dominant with each passing game, two stars that help make their team that much more difficult to play against. And, for the purposes of this campaign, it all started with an early season contest against St. Louis.